NIFTY(5396) - On 16th Oct 2010 post, hinted here when it made a top of 6284(click here) and 12th Nov 2010 post with Nifty chart, confirmed here when it perfectly topped out at 6339(click here). "MY UTLIMATE TARGET IN DOWNSIDE WAS 5300+"
Yes as expected, yesterday it attacked the mentioned down target, when it made a low of 5369. 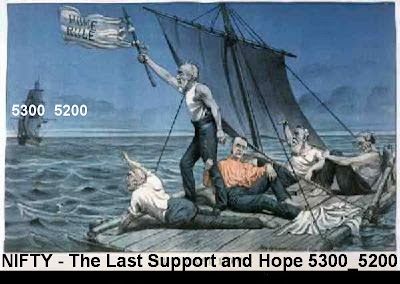 THE LAST HOPE AND SUPPORT IS 5300_5200 for entire year 2011. MY ULTIMATE TARGET IN DOWN SIDE 4200_3700. It may come in one wave or step by step with pull backs.